I don’t agree with the Tea Party on much of anything. I think their anger and misguided rage can be downright dangerous at times. There is one thing, though, that I do agree with them on: It doesn’t take huge amounts of money or great name recognition to win. It takes heart. I say this because some in the Florida Democratic Party have been sucked into Charlie Crist’s mantra that Nan Rich can’t win because she doesn’t have the money or the name recognition of Charlie Crist or Rick Scott. Charlie Crist used this same line of reasoning against Marco Rubio, by the way. See how that worked out for him? 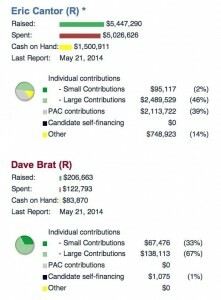 Eric Cantor, the House Majority Leader, lost in his Primary last night to an unknown, under funded challenger who had heart, and loyal supporters. 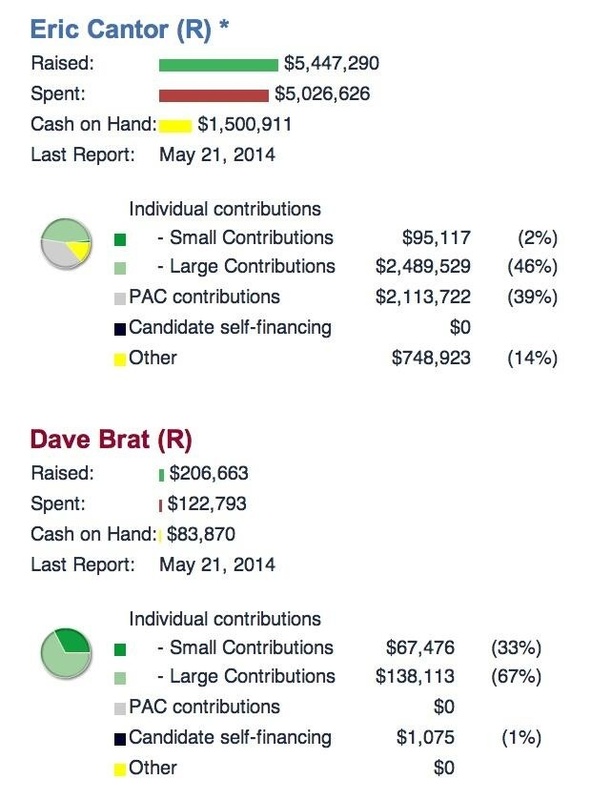 As you can see, Dave Brat had no money compared to Cantor, and certainly not the name recognition. He had people on the ground who supported him through all of the polls that had him losing by large margins. He had people supporting him even though the media, and Eric Cantor until the final stages of the primary, ignored him. It should. The same thing is happening right here in Florida to life-long Democrat Nan Rich. I have been telling everyone for a while now that the polls don’t tell the entire story here in Florida. What the polls aren’t telling you is that there is an ever-growing number of Florida Democrats, me being one, who are angry with what is happening with Nan Rich and the party leaders. We simply don’t want Charlie Crist as much as we don’t want Rick Scott. We don’t have felonious friends with deep pockets such as the Scott Rothsteins of the world. We certainly aren’t multi-millionaires who ran companies that bilked the government and had to pay hefty fines. What we DO have is heart, and belief in Nan Rich. Because of that heart and that belief, we are going to continue to put boots on the ground, fingers to the keyboard, signs on the road, and voices to ears in support of her. We know, just like the Tea Party, that fingers alone can’t do much, but together they can make a mighty fist. Florida Progressives need to realize this. Florida Democratic Party Leaders need to realize this. Charlie Crist isn’t the Florida Democratic Party’s savior. He is going to be the party’s Eric Cantor.